Outdoor Features | Stoneman, Inc.
We use American Fyre Designs by RH Peterson. These outdoor features are available in a variety of styles, colors and textures to complement any décor. 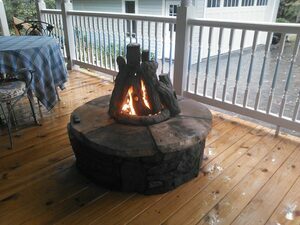 Choose from firepits, firefalls, fire bowls, fire tables, and fire urns. We will come to your home and help you choose from the beautiful selection of American Fyre Designs exterior fire features. We have the necessary experience to consul you on all your fireplace needs. Warm your outdoor living area with Stoneman, Inc. & American Fyre Designs. 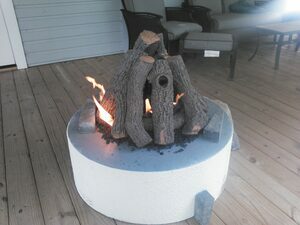 Our favorite is the Stucco Firepit Model OCR34. 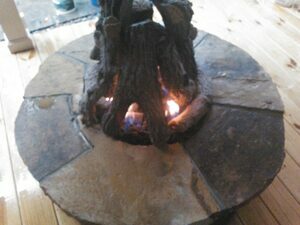 It is a 34" firepit with a stucco base and tiled ring. It comes complete with 12" base, burner and valve assembly, connector kit, lava granules and coals, and a burning display of your choice. You can build the American Fyre Designs Stucco Gas Fire Pit Kit to meet your design with multiple top designs to choose from and burning displays for the flames to dance about. Or you can eliminate the top ring and add the stone of your choice to the top and base. Can be installed without the top tiled ring! Add the stone of your choice to the top as well as the base! 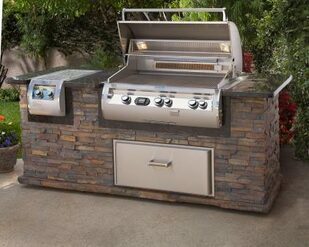 FireMagic and American Outdoor Grill: The world’s finest grills provide the very very best in outdoor cooking! You can rely on the superior performance of FireMagic and American Outdoor Grill for many years to come! Choose your favorite from a wide selection of Natural or Propane (LP) gas models in porcelain or stainless steel finishes. Stand-alone, that can be used on the patio, deck, by the pool, in the shade! Or Built-in - at the lively center of your outdoor living environment. All are stainless steel construction. FireMagic - made from the highest quality materials, with the most advanced features, and backed by the industry’s best warranty. 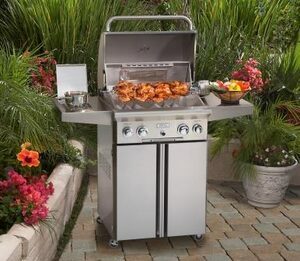 American Outdoor Grill - high performance, well-made grills and accessories without an expensive price tag. Both bring patio barbecue grilling to perfection! AOG Portable Outdoor Grills can be used on the patio, deck, by the pool, in the shade, or just about anywhere! All heavy duty stainless steel construction including burners, grids, and vaporizer panels for even heat distribution. The AOG accommodates charcoal or wood chips with ease. Features include: Rotisserie backburner, electronic push button ignition, easy cushion lid bumpers, heavy duty warming rack, flush mounted brass side burner, solid brass valves for exacting temperature control and long life, and a 15 year warranty on burners, and a 10 year warranty on parts. Above: Model 24PC (24 Inch Grill) features: 432 square inch cooking surface, 32,000 BTU’S primary grilling area, and flush mounted brass side burner. With sleek lines, a unique contoured face and state-of-the-art features such as ALL stainless steel construction, hot surface ignition, blue backlit knobs, heat zone separators, electronic digital thermometer, a dedicated woodchip smoker drawer and an optional Magic View window, Fire Magic combines the ultimate in performance, beauty and innovation. The Diamond Echelon defines luxury in grilling! Left: Model E790s (36 Inch Grill) features: 792 sq. inch cooking surface, 99,000 BTU’S, & double side-burners. Let Stoneman, Inc. custom-build an outdoor kitchen for you! Arrange seating . . . add a sink . . . a small refrigerator . . . a side burner . . . all the extra comforts that you want & need! We will build your Outdoor Kitchen according to your plans, or allow us to design it for you! 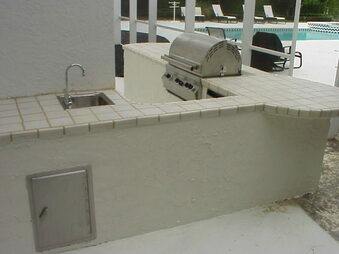 Right: Custom-built Outdoor Kitchen with FireMagic grill, sink, and refrigerator. We carry the top leading names in the barbecue industry!